Hello colleagues. Greetings from Denmark, My interest in the violin and violinmaking began through a general interest in music generated by both my parents. Even though classical guitar and later rock and jazz music was my main interest, the violin was always attractive as a beautiful object. My first encounter with its sound, was an old recording of David Oistrakh playing the Bruch concerto. My father played the violin, until one day when the neck broke off. So at 7 years of age, I had my first attempt of violin repairing, trying to glue it back together. Naturally the repair did not last long and the violin was thrown at the fireplace !! My training to become violinmaker began in 1982 at the Welsh school of Musical Instrument Making. For me this was a lucky situation with excellent teaching from Miranda Green, Terry McCool and Malcolm Siddall. With students from all over the world, the atmosphere was great. I finished in 1985 and went back to Denmark to work for the Hjorth family in Copenhagen. Since 1986 I have been running my own business in Aarhus (Denmark's second largest town) doing repairs, buying and selling and some occasional new making. I like all aspects of the business so each day is very busy. At the moment I am chairman of the Danish Guild of Master Violinmakers. Our organisation is quite small - we only have 11 members - this being the total number of makers with a professional training and own active business. The population of Denmark is only 5.million people, but there are about 195 amateur makers who have their own organisation. This can sometimes cause problems. 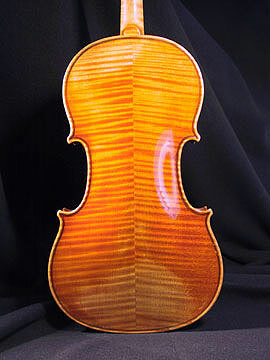 I do not mind at all when people wish to make new violins from pure interest, but when I get instruments in my shop that have been glued with araldite or superglue, "sound improved", stripped and revarnished, my expenses of migraine medicine and psychological counselling rises dramatically! Do you see the same problems in England? I collect instruments made by Danish makers of the past and also do a lot of research on their family background, their history and time they were living in. Historically, Denmark has always had a vast influx of culture and craft-traditions from neighbouring countries. Music has through times played an important role in all parts of society. The Royal Danish Orchestra has roots back to the years around 1450 and from 1500, the larger towns around the countryside had their own "town musicians" who were in strict charge of all musical activities. Music was regarded as a craft, so to become a musician in those days, one would have to be apprenticed to the master musician of the town. Musical-conservatories only occurred much later, the first of its kind opening in Copenhagen in 1867. Of great importance was King Christian the 4th (1577-1648)- who spent large sums of money to send Danish musicians and composers to countries like Italy to be educated properly. He increased the number of musicians of the Royal Court Orchestra to 77 including singers. From 1598 - 1606 he employed the eminent English luteplayer John Dowland (1562-1626) as chief composer. However Dowland was not always happy in his position as court lutenist (part of his duty was to play with other musicians in the cold and damp cellar of the Rosenborg castle - from which an intricate system of tubes could lead the sound to his majesty's private chambers - the first Hi Fi-stereo system available!). Like in most other countries the violinmaking situation has always been linked to the economic ups and downs through times. Some violinmakers like Jesper Gotfredsen (ca 1708 -1774) began their careers as town musicians and later transferred to being instrument makers. The country has always had contact with German born musicians, and this way we find links to violinmakers like Johan Karp (ca. 1700 - 1730) and Johan Hinrich Schnabel - (1744-1799), both of German origin. Besides violinmaking, an important income was had from supplying "Roman" (i.e Italian) gut strings and sheet music paper to the orchestras. The period 1835 -1945 is what I would call the golden age of Danish Violinmaking. From about 1840 makers like Thomas Jacobsen (1810 - 1853) (who trained among others with J.B.Vuillaume), Gulbrand Enger (1822-1886), and Emil Hjorth (1840-1920)- (who trained with Bernardel Père) began to apply foundations for financial help to study violinmaking in European countries and from this period instruments will generally show a stronger inspiration from Germany and France. Having had contact with famous musicians like Ole Bull, Pablo de Sarasate and Heinrich Wilhelm Ernst, these makers made some very interesting instruments. During this period it is interesting to observe two parallel lines of violinmaking traditions. One line starting with Ole Dreier, a Norwegian who began making violins in Copenhagen around 1797-followed by a long series of violinmakers who were nearly all trained by each other. The other line being the Hjorth family which started in Copenhagen in 1789 continuing from father to son. Today the 6th generation of the family Mr.Mads Hjorth continues this tradition. Naturally there have been more makers in the country, but they all seem to have links to the aforementioned two lines. Around 1930 a decline in violinmaking activity can be observed. The gramophone and sound movies causing the old music hall orchestras to close down leaving classical music to the Royal Orchestra and the newly formed Danish Radio Orchestra. In 1925 there were about 16 self-employed professional violinmakers. In 1950 the number was down to about 6. To claim that there is a Danish "school" of violinmaking is probably a bit too enthusiastic. However I would point out that the Danish makers somehow have their own character with hints and observations to the traditions of the neighbouring countries. Some of the early instruments are made of locally grown wood and a primitive dry shellac is applied. Later (from 1830 -onwards) better quality materials and oilvarnishes are to be seen. The photographs show a violin made by Gulbrand Enger in Copenhagen - 1870 This instrument has an interesting hand written signature on the inside of the belly. When translated it reads "Exact copy of the Yoldi Stradivari". The "Yoldi" Stradivari was made in 1714 and has been played by the concertmasters of the Royal Philharmonic Orchestra in Copenhagen ever since it became their property around 1860.